I am leaving for the airport in just a few hours to fly to New Zealand for the Autumn Escape Event, but I really wanted to do a blog post before I left. I will need to limit my words, which is something I'm not used to around here, but I hope you will stick with me till the end to see the final result. 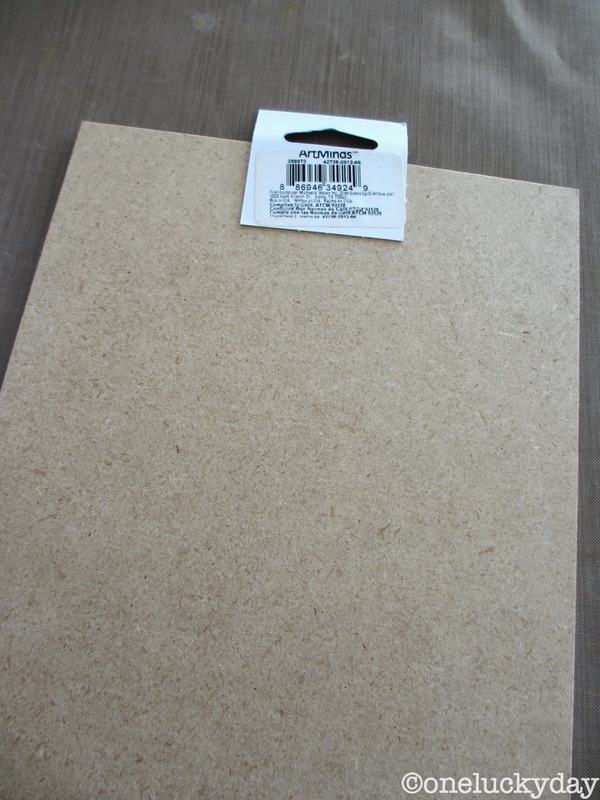 I purchase a little pressed wood panel from Michaels - found it in the wood cut outs department for about $2.50 I think. Then a coat of Peacock Feathers. Next a haphazard coat of Mowed Lawn. And lastly, another haphazard coat of Shaded Lilac. I went back over the paint in a few places in a horizontal motion. the end result of the Distress Paint layers. I picked up this great set of number stamps at JoAnns - the numbers are about 2 1/4" tall. Cute and just the perfect size for this project. I made a puddle of paint on the craft sheet to pounce the stamp in. Not too much, shouldn't be soupy on the stamp and no, I didn't use a block. I just stamped the board in random places and let it dry. Once dry, I sanded away a bit of the paint to reveal the background. I grabbed the new Stamper Anonymous stamp set - Big Top and some Ranger watercolor paper for the next step. I cut the watercolor paper to fit the stamp I wanted to use. Then used Distress mini's to create a color pallet on the craft sheet. Added water to the mix, then swiped the watercolor paper through it numerous times to get a wonderful layered look. I stamped the card with jet black Archival ink. I added some paper ephemera with Multi-Medium. Then a little ink around the edge. I decided I need to mask something off so I used the Arch Frame to create the mask shape. I taped it down with tissue tape. Then used the Harlequin layering stencil to create a pattern over the mask. Can you tell where i'm going? The elephant needed a circus tent, right? I used a Stabilo pencil for the lines and filled in the flag with a bit of paint. Add the elephant with Multi-Medium over the tent. and a few Remnant Rubs. If I would have had the time I would have added a few more details but I'm still happy with the way it turned out. As I said at the beginning, I am leaving for New Zealand and then on to Australia. I hope to be posting on Instagram (luckyday) and my Facebook page so stop by for a bit of the journey. LOVE this project!! Safe travels Paula!! Wow Paula, another brilliant project! I totally love how you created that dry-brushed background (lovely colours too), the stenciling, stamping and other elements make for another brilliant mixed media project. Love it!! Safe travels and I hope you will have a fantastic time!! Great project, just love it. Fabulous circus tent. Another cool project! Love your creativeness!! Happy, safe and Lucky travels, Paula. Fabulous! Love those big numbers and the big top stamps, Enjoy your travels. How cute! Safe flight. See you on Instagram. I love how you can just whip something up in the midst of getting ready for a transcontinental trip :-) This is darling. Wishes for a safe and happy trip. An arch into a circus tent... But of course! You amazing. Be safe. Love it! So going to use that background technique and colors. Ya big tease, I so want to know who will be posting in your absence, hee, hee. Have a fantastic trip. SO SO SO cute, I love the circus, need to get these stamps, and do this too. Have fun on your travels!! Great project Paula very cute indeed. Now Carry On!!! A big top beauty!!!! Love love love it! Now I need popcorn! I have seen this stamp set and wondered how it could be used and now you have provided some amazing ideas. Have a safe trip. Looking forward to the fun with the surprise artist. Thank you! Stunning. I love it.... have a fab trip..
That is fantastic, I love the background & the circus tent looks great. This is lovely Paula! What a great idea to use the Arch die like that to create a circus tent. Have a good trip to New Zealand! Omg! That is awesome and the perfect sentiment for it! Have fun in New Zealand! Beautiful project! Have a safe, fun trip. Love the project! How did I miss these stamps?? Have a wonderful journey! This is awesome Paula! Have a safe trip! This was so fun to see pics from start to finish! Great job! I absolutely love the project !!! Love the project, love the colors. One of my favorite stamp sets ever! thanks for the tips - i like the mask and the stencil -have a safe trip! Wonderful project and thanks for sharing all the steps.Can't wait to get my hand on these stamps. They are on topof my "need" list. Another brilliant idea and awesome piece of art Paula! This is too perfect for words! The circus tent is brilliant. And thank you for taking me throught the whole process in full detail! LOVE this. A huge thank your for the lovely comment on my blog too! Oh, what a treat! Beautiful colours and such fun! I love those little stamp set versions of the SA stamps... wish they were easier to get hold of here in the UK!